Have you ever wondered how your campaigns are doing from platform to platform? Monetate recently published their quarterly Ecommerce report, measuring conversion percentages and overall sales from 2015-2016. They discovered that when it came down to customer retention, an alarming 78% of consumers would only engage in offers which were personalised from prior engagements with your brand. They also found that although 2016 capped off the largest sales period in history, it performed very poorly in-regards to customer retention. Only 1% of customers acquired during Q4 2015 holiday season were present on the same site in December 2016. It's always interesting to see how conversion rates change from each platform to each country. As mobile conversions increase, traditional platforms and tablet devices are taking a dip. On a more surprising note, tablet usage for shopping has not only decreased, but it's decreased faster than traditional devices. This number however can be a bit grey since most new laptops have screens that can detach from the keyboard and become a tablet. Unbounce also recent published a breakdown of how each global industry performs. 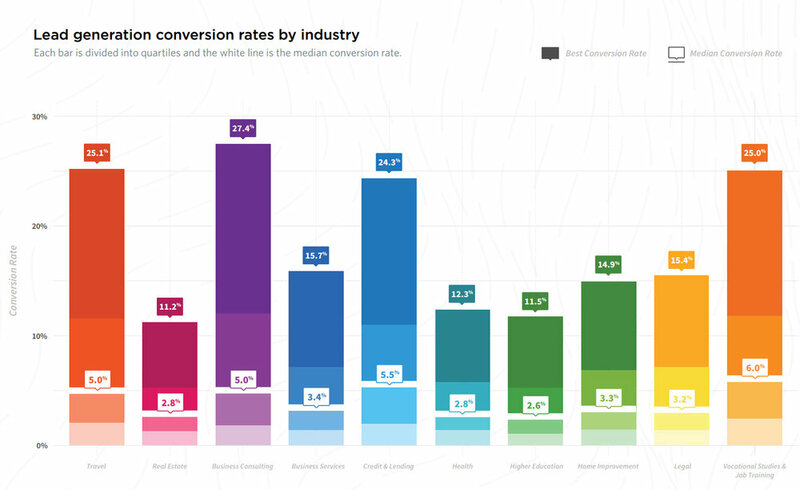 They focused on comparing the median conversion rate with the best conversion rate. Once again, remember the convenience vs practicality question. Consumers want to do research on the go, that's where the massive 30% to 43% jump has come from. It just makes more sense. Although traditional visits have decreased, the actual global conversion percentage is still more than twice has high as mobile devices (4.14% vs 1.55%). People want to do research on their phones, but they want to seal the deal on a larger device. Customer attention spans are decreasing at historic levels. In just the past year on a global scale, the average page views per shopper has decreased almost 30% from 14.53 to 10.21. If your sales didn't stack up to the figures above, then it's time for a boost. Try using SMS marketing or SMS alerts to get customers excited about your products and services.